Early Earth wasn’t the most hospitable place in the Universe, but some in all this chaos life emerged. Image credit: Peter Sawyer / Smithsonian Institution. One of the most famous chemistry experiments of the last century was the ‘primordial soup’ project initiated by Stanley Miller. The chemist wanted to see what would happen if you mixed methane, ammonia and hydrogen – all substances readily available on Earth before life began – and zapped them with electricity, to create a phenomenon analogous to lightning which would have been pretty frequent during those times. He found that the gaseous mixture turned into a liquid rich with amino acids in a reaction channeled by the electricity. The amino acids are essential to life as we know it since these form proteins when snapped together. So, armed with this fantastic new found knowledge Miller hypothesized that since simple chemicals could be turned into biological molecules in a lab, then something similar may have led to the formation of life on Earth billions of years ago, with some added steps in between of course. 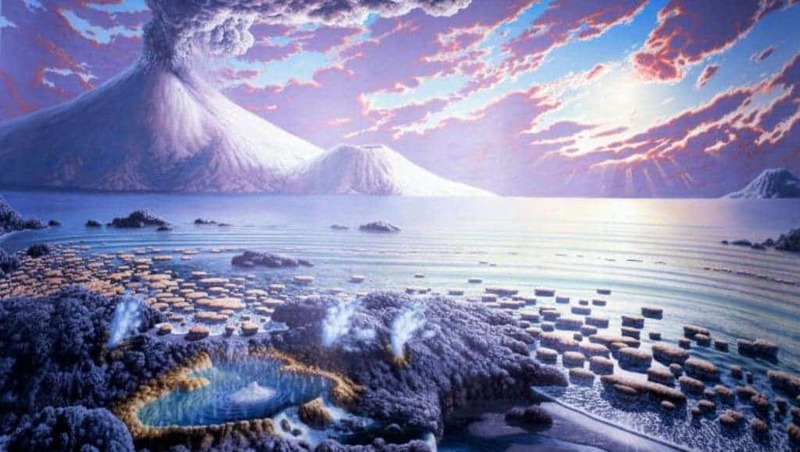 Since then, the primordial soup experiment has been repeated countless times with variations as our understanding of the early Earth evolved. For instance, since Miller’s famous first tries in the 1950’s scientists today have made sugars and DNA building blocks, all just by starting from a suit of primordial chemical. It’s still unclear, however, what are the intermediary products and what are mechanics that eventually lead to biomolecules. Unlike Miller, scientists today have access to supercomputers that can keep track of many complicated interdependencies and relationships. Researchers in France used such a supercomputer to model how a couple of primordial chemicals interact and transform when subjected to an electric field of increasing strength. The model tracked the formation of intermediate molecules that eventually turned into glycine, a simple amino acid that often shows up in Miller-type experiments. Before glycine, however, the gases first joined to form formic acid and formamide. We’re still a long way from being able to make actual life in a lab jar, but these more recent findings definitely help. In their paper, published in the journal Proceedings of the National Academy of Sciences, the scientists also outlined that astronomers might want to look for signs of these chemicals on Earth-like exoplanets – it might give them clues as to where it might be likely to find extraterrestrial life.